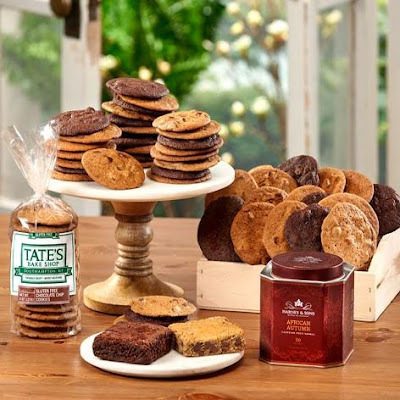 I've been a big fan of Tate's Bake Shop's gluten-free chocolate chip cookies since discovering them a few years ago; they're thin and crunchy with large chocolate morsels studded throughout each and every one. I can say - without hyperbole - that they are the best packaged gluten-free chocolate chip cookies on the market. Tate’s produces its gluten-free baked goods in a dedicated gluten free facility. The cookies are made using rice flour and the brownies and blondies are made with almond flour. Additionally, products are tested both internally and by an outside accredited laboratory. The gluten-free products test at 5 ppm (gluten) or lower. Tate's is also recognized by the Celiac Support Association. To enter up to four different ways, follow the instructions below. Entries are being accepted through 11:59 p.m. Eastern on Sunday, September 11. The winner will need to respond to a notification email and provide a U.S. mailing address within 24 hours of the end of the giveaway. Good luck! DISCLOSURE: Neither I am nor any immediate family member is an employee, officer, director or agent of Tate's Bake Shop or its respective parent, subsidiary and affiliated entities, advertising and promotional agencies. This post contains affiliate links. Click here for my complete Disclosure.